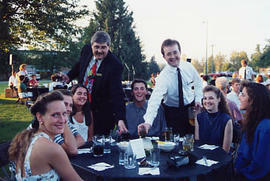 Photograph of Ron Kuehl and Gord Down serving as a waiters at the Freshman Dessert in the Garden event, which is taking place in September, 1991, on the lawn in front of Douglas Hall. Photograph of students Diane Denney and Gord Down posing at their graduation banquet. 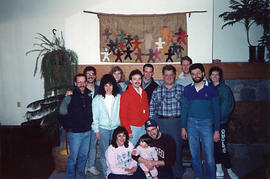 Photograph of students Gord Down, Bruce MacInnis, Barbara Prosser, Mike Sprenger, and Diane Denney standing at a podium on stage at the Founders' Week Celebration.